It was a snowy home opener for Quinnipiac, but it was all Hartford (1-3, 0-0 America East) as they held the lead for 37 minutes in their 68-54 win against Quinnipiac (0-2, 0-0 Metro Atlantic Athletic Conference). Starting point guard Rich Kelly is out with an MCL sprain. Kelly was a big part of the Bobcats 2017-2018 season, averaging 11.1 points and 4.7 assists per game. With Kelly’s absence, the young players had to step up. Freshman Tyrese Williams started and played 35 minutes recording seven points. Freshman Tyree Pickron played over eight minutes, and junior Travis Atson, a first year transfer from Tulsa, started and played 35 minutes, in which he scored 11 points. Grad student Cameron Young has taken on a leadership role this year. Against Hartford he played 36 minutes and lead the team with 17 points. Quinnipiac did have 22 points in the paint compared to Hartford’s 18. However, it was the three point shooting that really killed Quinnipiac. The Bobcats shot 27.6 percent from three-point range, making eight of 29 three point attempts. When the Bobcats get off rhythm on the offensive side of the ball, they rely heavily on the three pointers. Williams cut the lead to seven with 13:50 in the second half, but after that the Bobcats would throw up four three pointers in a row and their deficit would increase from seven to 13 in just two minutes. I thought we came out tentative and not aggressive tonight,” Dunleavy said. The Bobcats also shot 20-for-58, resulting in a team field goal percentage of 34.5 percent. “I thought we were getting good open looks. We just weren’t getting them down,” Young said. Despite Hartford controlling the lead for 37 minutes of the game and extending the lead to 54-37 at the beginning of the second half, Quinnipiac never gave up. The Quinnipiac crowed got fired up when Kevin Marfo to cut the lead to seven with 3:25 left to play, but Quinnipiac would never be able gain the lead. Quinnipiac is starting the season off 0-2, coming off a loss to the defending national champions and current No. 8 Villanova. Dunleavy said that this is a similar look to last season where Quinnipiac started 1-5. 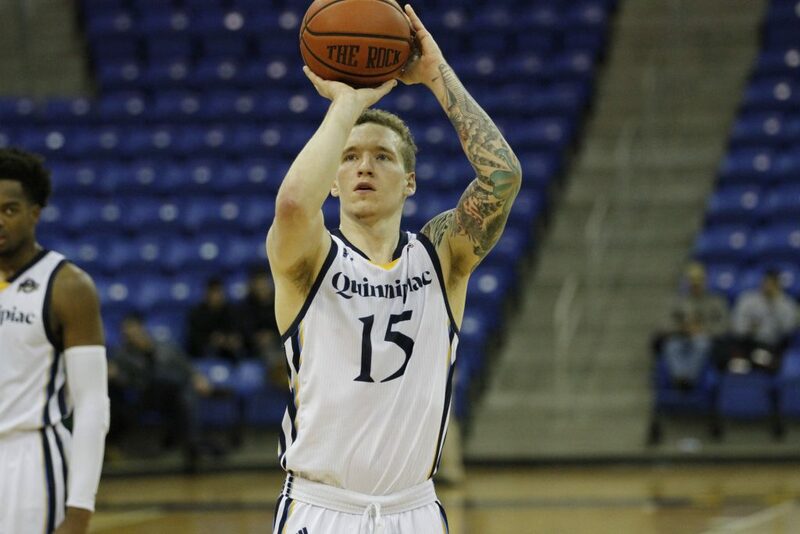 Dunleavy vows Quinnipiac will learn from the early season losses.